The Holy Spirit or The Spirit of Yahweh is a subject that is very important for all believers in Messiah to understand. I believe the power of the Holy Spirit is needed in our lives so that we can walk according to Yahweh’s will and full potential for us. We must be led by HIS spirit. Let’s start with the basic understanding. Please do your homework and see that all believers need to baptised by the Spirit of Yahweh so that we can walk in the fullness of His power and do His will. Rejecting the baptism of the Holy Spirit is rejecting the Spirit of Yahweh. Don't allow what you've seen on television affect the truth of Yahweh's word. Also, there are nine different gifts of the Holy Spirit, not just one. Some people think that the "Holy Ghost" didn't come to earth until the New Testament. That is because the words Holy Ghost are not found in the pages of the Tanakh (Old Testament), but "Holy Spirit" is found in the Tankch many times. Even David in the Psalms prayed "Psa 51:11 Cast me not away from thy presence; and take not thy holy spirit from me." There are several different words use in the Scriptures to describe the spirit of Yahweh. They are Holy Ghost, Holy Spirit, Spirit of Yahweh (Spirit of the LORD or Adonai), and the Hebrew term which is Ruach ha Kodesh. Yahweh is still alive and He still moves in the hearts and lives of His covenant people. He still performs miracles and still gives each of us gifts as stated in the Scriptures in I Corinthians 12:7-11. 1Co 12:7 But the manifestation of the Spirit is given to every man to profit withal. 8 For to one is given by the Spirit the word of wisdom; to another the word of knowledge by the same Spirit; 9 To another faith by the same Spirit; to another the gifts of healing by the same Spirit; 10 To another the working of miracles; to another prophecy; to another discerning of spirits; to another divers kinds of tongues; to another the interpretation of tongues: 11 But all these worketh that one and the selfsame Spirit, dividing to every man severally as he will. I have experienced the power of the spirit of Yahweh during times of worship and the Father has spoken directly to my heart to do certain things for him many times. I have seen and experienced all of the gifts being used and none of them are done away with. Yahweh is the same yesterday, today, and forever. He wouldn’t give us gifts and then take them away, any more than we would give a precious little baby a gift and then take it away. Mat 7:11 If ye then, being evil, know how to give good gifts unto your children, how much more shall your Father which is in heaven give good things to them that ask him? One of the main messages that Yahweh has put on my heart to share at churches, assemblies, fellowships, and congregations is about not grieving the spirit of Yahweh and the importance of people being baptized with His spirit (Having the overflowing presence of the Almighty in our lives). How can we walk in His full potential if we reject His power, His presence, or if we are constantly grieving Him by making up our own rules and tossing out the rules He gave us in the Scriptures? How do we grieve Him? Through entertainment such as TV, books, music, internet, video games, jokes, the way we dress and act, our lifestyles, images in our homes, or complacency (not doing anything at all for His kingdom). The following Scriptures tell us what our lives should be like if we are truly walking in the Spirit of Yahweh. Gal 5:16 This I say then, Walk in the Spirit, and ye shall not fulfil the lust of the flesh. 17 For the flesh lusteth against the Spirit, and the Spirit against the flesh: and these are contrary the one to the other: so that ye cannot do the things that ye would. 18 But if ye be led of the Spirit, ye are not under the law. 19 Now the works of the flesh are manifest, which are these; Adultery, fornication, uncleanness, lasciviousness, 20 Idolatry, witchcraft, hatred, variance, emulations, wrath, strife, seditions, heresies, 21 Envyings, murders, drunkenness, revellings, and such like: of the which I tell you before, as I have also told you in time past, that they which do such things shall not inherit the kingdom of Yahweh. 22 But the fruit of the Spirit is love, joy, peace, longsuffering, gentleness, goodness, faith, 23 Meekness, temperance: against such there is no law. 24 And they that are Christ's have crucified the flesh with the affections and lusts. 25 If we live in the Spirit, let us also walk in the Spirit. 26 Let us not be desirous of vain glory, provoking one another, envying one another. The word "anointed" is derived from a verb which means to pour or rub a substance (usually oil) on someone. In the Bible, people were anointed with oil to serve as prophets, priests, or kings. Yeshua was anointed with the Holy Spirit to be the Prophet like unto Moses (Deut. 18:15¬19), our High Priest after the order of Melchizedek (Heb. 5:6-10), and the King of kings (Rev. 19:16). 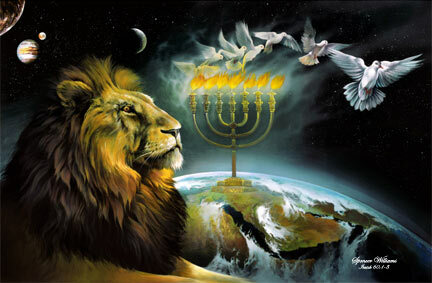 Rev 4:5 And out of the throne proceeded lightnings and thunderings and voices: and there were seven lamps of fire burning before the throne, which are the seven Spirits of Elohim. The following are notes I took when doing a study about the spirit using E-Sword Bible software. The word spirit in the Tanach (Old Testament) is found 244 times in 222 different verses. The word in Hebrew is Ruach (Strong’s Concordance # H7307) and is used 379 times. The words holy spirit together are found in the Tanakh 20 times in 9 verses as listed below. The word ghost in the Tanakh is found 11 times in 11 verses. 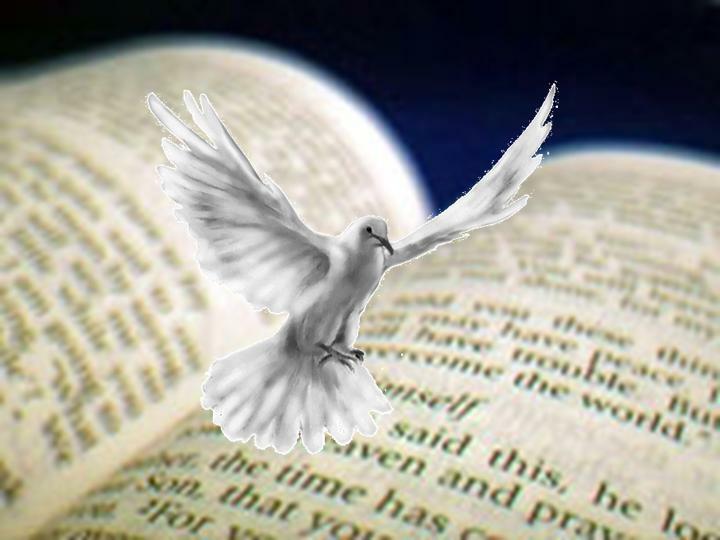 The words holy ghost together are not found in the Tanakh. The word in Hebrew is gava (Strong’s Concordance # H1478) and is used 29 times, but the word ghost in the Tanach has to do with death and not with the Holy Spirit. The word spirit in the Brit Chadesha (New Testament) is found 261 times in 234 different verses. The word ghost in the Brit Chadesha (New Testament) is found 98 times in 97 different verses. Six of those times it has to do with death and the remaining times it is the Holy Spirit. The word in Greek for both spirit and ghost is pneuma (Strong’s Concordance # G4151) and is used 385 times. The words holy spirit together are found in the Brit Chadesha 24 times in 12 verses as listed below. But the words holy ghost are found in the Brit Chadesha 183 times in 89 verses as listed below. e-Sword software, let us know and we'll send you one. We have a new custom DVD that will even read the Bible to you! is no lie, and even as it hath taught you, ye shall abide in him.” This is one reason the anointing of the Spirit is so important. It is the anointing that teaches you. Without the anointing in your life, you will not learn spiritual truth, even if you are listening to a heavily-anointed teacher. It is the anointing in your life that teaches you, not the person who is speaking or writing the words that you hear or read. The Divine Teacher, the Holy Spirit of Yahweh, has to cause those words to sink into your heart and become a part of you. Act 19:1 And it came to pass, that, while Apollos was at Corinth, Paul having passed through the upper coasts came to Ephesus: and finding certain disciples, 2 He said unto them, Have ye received the Holy Spirit since ye believed? And they said unto him, We have not so much as heard whether there be any Holy Spirit. 3 And he said unto them, Unto what then were ye baptized? And they said, Unto John's baptism. 4 Then said Paul, John verily baptized with the baptism of repentance, saying unto the people, that they should believe on him which should come after him, that is, on Messiah Yeshua. 5 When they heard this, they were baptized in the name of the Master Yeshua. 6 And when Paul had laid his hands upon them, the Holy Spirit came on them; and they spake with tongues, and prophesied. Some people do not even know what the anointing is, because they have never experienced it. They have never had the Holy Spirit come upon them in such a way that can be felt. 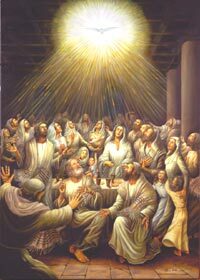 They have never experienced the joyous moving of the Holy Spirit deep within their being, and the blessing the Spirit brings. They do not know what it is like to be so powerfully touched by the Spirit that external manifestations occur. External manifestations are the normal evidence and result of the anointing which comes to teach you. Please, don't be afraid of the power of the Holy Spirit. The devil has done everything he can to make the gifts of Yahweh’s Holy Spirit look like foolishness. When we talk about this subject, some think about groups of people who have tried to “conjure up” or fake a manifestation of the Holy Spirit. They want to look spiritual so they fake a gift so that they appear to be “ok” with Yahweh because his spirit “showed up” at their services. That is not to be compared to the true move of the spirit of Yahweh amongst His people. It is very important not to quench the Holy Spirit or to speak against the true works of the Spirit of Yahweh. Don’t let Ha Satan (the adversary) rob you of a blessing! Remember, he comes to STEAL, KILL and DESTROY! Being a follower of the Messiah is much more than living an upright, moral life, being active in church, observing Shabbat, wearing tzitzit, going to Torah study, and having shofars, menorahs, and mezuzahs. All of these things are important, but we need to have the anointing of Yahweh's Spirit so that we can be led by Him and follow His desires for us. If you have never experienced the anointing of the Holy Spirit, or if you do not experience it on a regular basis, I urge you to seek our Heavenly Father with all your heart in fervent prayer for HIS anointing until you are saturated with His Spirit. What has the Father called us to be? The answers are holy, pure, upright, blameless, separate, clean, righteous, anointed, kings, royal priesthood, dead to self, disciples (disciplined), His bride, etc. We are to look, act, smell, walk, and talk like the bride of the Messiah. The world around us should have no doubt as to whose bride we are.